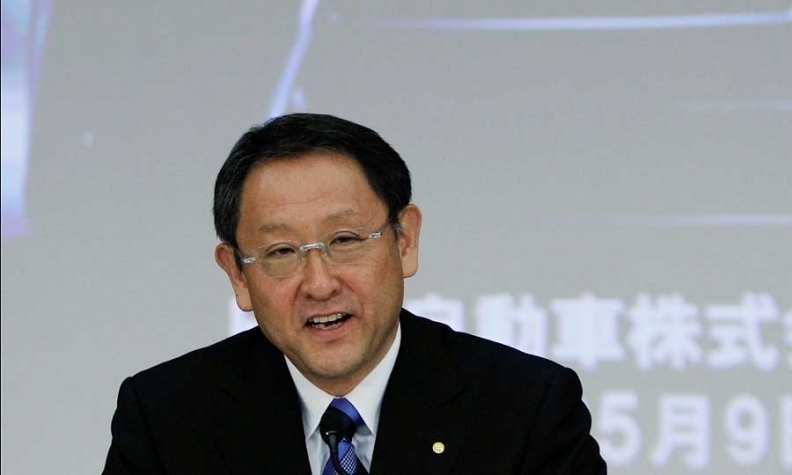 Akio Toyoda, in his speech today, said: "It was therefore thanks to our dealers, suppliers and employees who endeavored to keep improving our earnings structure that we managed to remain in profit in this environment. I would like to express my heartfelt gratitude to them." TOKYO -- Toyota Motor Corp. predicts surging North American sales will deliver its highest profit in five years, as the carmaker rapidly rebounds from last year's natural disasters. North American sales are seen climbing 25 percent to 2.35 million vehicles in the current fiscal year ending March 31, 2013. Sales in Toyota's second-biggest market slid 7.8 percent to 1.87 million units in the just-ended fiscal year, as an earthquake in Japan and flooding in Thailand crimped supply. But North America remained one of the company's more profitable regions despite the decline and is poised for growth. Revived North American sales will power Toyota to near record global sales of 8.7 million vehicles this fiscal year, Japan's largest carmaker said today in its annual earnings presentation. Toyota's worldwide sales peaked at 8.91 million vehicles, on a fiscal year basis, in the 12 months ended March 31, 2008. The carmaker predicted the return to sales levels seen before the global financial meltdown will help it more than double net income to 760 billion yen ($9.5 billion) this fiscal year. The forecast compares with net income of 283.6 billion yen in the fiscal year ended March 31, 2011. Analysts project Toyota's current fiscal year net income will reach 817.7 billion yen, according to a survey of 21 analysts by Bloomberg. The carmaker expects sales to rise 18 percent to 22 trillion yen this year. Still, the forecast indicates Toyota may earn more profit than General Motors Co. as Akio Toyoda, grandson of the founder, rolls out new Prius hybrids, Corolla compacts and Lexus sedans to regain lost ground in what may be his first crisis-free year since becoming president in 2009. Toyota wasn't alone as Honda Motor Co. last month reported annual profit fell 60 percent and Nissan Motor Co., which reports May 11, has said since February that net income would slide 7.9 percent in the year ended March 2012. Toyota's projections indicate it will earn more than GM, which last week reported first quarter net income fell 61 percent to $1.32 billion on losses and restructuring costs in Europe. Analysts estimate it will earn $7.38 billion over the next four quarters, excluding preferred dividends, which last year totaled $1.61 billion. But after ceding its title as the world's largest automaker to GM in 2011, not much is going wrong for Toyota in its two biggest markets this year. Toyota sold 82,000 units in China during April, a 68 percent increase from a year earlier, according to Toyota's China spokesman Niu Yu. The carmaker was suffering from production disruptions from the March 11 earthquake in Japan last year. Toyota built 46 percent of its cars in Japan in the year ended March, making it more vulnerable to a stronger yen than its nearest rivals. Nissan built 25 percent of its vehicles in Japan last fiscal year while Honda produced 28 percent of its cars at home. For all of Toyota's presentations today, click here. Hans Greimel and Bloomberg contributed to this report.